iOS apps have been flowing from Google in recent months like wine at Odysseus’s homecoming party. 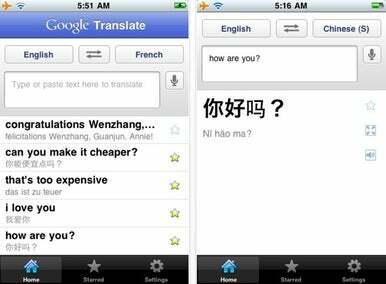 On Tuesday, Google announced the release of Google Translate, an official app for its real-time language translation service and its fourth iOS app in as many months. Google Translate allows you to speak a word or phrase in one language and see or hear the result in another. As of this writing, the app can accept voice input for 15 languages, translate into 50, and speak a synthesized translation in 23 languages. Google appears to have borrowed a few of the streamlined interface elements from its iPhone-optimized Google Translate mobile site, which it released way back in 2008. As with many Google services you can star a translation for easy access to it later and even zoom text output for easy reading or sharing with your conversational companion. Google Translate continues a recent app-a-month trend for Google, beginning with the long-awaited arrival of Google Voice in November. It followed up with Google Latitude in December, then Google Places in January. And before you ask: yes, I’m sick of attaching the “Google” name prefix to all these apps. Like virtually every other consumer product Google offers, Google Translate is free. It requires iOS 3.0 or later and is available now in the App Store.